Disclosure: I received a copy from the author in exchange for an honest review. "Af's presence was a serious distraction. If he wasn't there, Kelly was thinking about him and was restless until she saw him again. When he was there, well, she was maddeningly aware of it on a molecular level." Warning: This review may contain spoilers concerning Last Condo Board of the Apocolypse. After narrowly preventing the last apocalypse, Kelly Driscoll finds herself with an unlikely day job. She's the interim manager of Amenity Tower, one of the few buildings still left standing in the rubble of Pothole City. But after answering a mysterious phone call, she signs up for a new mission that's a perfect match for her skills: locating the missing president of the famed Cluck Snack brand. As Kelly quickly learns, the missing executive is only the beginning of Pothole City's problems. The city's leading donut shops -- run by two very different Gorgon monster siblings -- are engaged in a bitter territorial dispute. Plus, the residents of Kelly's building have hatched a new plot to kill the beloved single-purpose angels and set the stage for another apocalypse. Remember that time I read the strangest book ever? As it turns out, it's quirkiness was oddly charming and the longer I mulled it over, the more it grew on me. Suffice it to say, I was crazy enough to dive in for more and Nina Post was kind enough to provide. The Last Donut Shop of the Apocalypse is the entertaining sequel to Post's odd Apocalypse series. Where it took awhile for me to really understand the mechanics of this urban fantasy universe in the first book, the second is much more straight forward in regards to plot and premise. And I was pleased to find that what I most appreciated in The Last Condo Board of the Apocalypse---its weirdness, humour and style---is still very much present here, making for an even more memorable reading experience. Picking up right where The Last Condo Board of the Apocalypse left off, we find out just how Kelly, Af and the rest of our favourite SP's are faring after the saving and subsequent destruction of Pothole City. Kelly is now Interim Manager of Amenity Towers, taking care of the SP's and flirting with Af. Af, hunky as he is, is as clueless as ever when it comes to relationships and girls, more specifically, Kelly. Raum and his sub-committee are still on their pesky mission to bring about the destruction of Pothole City, culminating in an inexorable escape. And though many zany things happen throughout the course of the story, the central crisis is all about Kelly. Thrust into a new job, she struggles to adapt as everything around her changes. She feels lost, inadequate, without purpose and I think most of us can certainly relate. And on top of that, she's now called on a mission to find potential family member and missing president of the Cluck Snack brand. You know, it's all in a day's work. One of the things I was most looking forward to was watching the relationship between Af and Kelly unfold. After all the sparks between them in the first book, Post doesn't disappoint here. There's that characteristic awkwardness of the "does he/she like me as just a friend or more?" developing as they get to know each other better. I loved the tension that precedes a new relationship but proceeds the initial sparks, it felt very real. Post kept me on the edge of my seat wondering if/when they'd finally get together. And then there's the characters. We get to know so many more of the SP's and they are each unique and quirky and loveable. There's also Stringfellow, the human-turned-ferret. Can I just say how much I ADORED him?! He's sarcastic, funny and too adorable and undoubtedly, my favourite character in the entire book. And not only that, but the subtle references to other pop culture phenomenon (i.e. - Spinal Tap) kept me continually entertained. While ridiculous politics and absurd social commentary are still there, it's easier to decipher this time around. It may have taken some time for the first book to settle in a positive way, I didn't have that problem here. The characters are charming, the storyline is easy and fun and the revelations are poignant as ever. In short, it's a win-win all around! 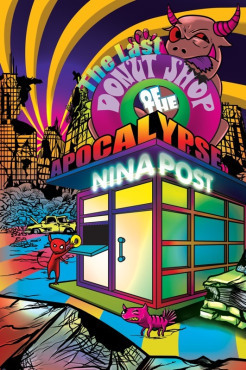 The Last Donut Shop of the Apocalypse is a fun addition to Nina Post's weirdly amusing Apocalypse series. In this book, we get to know the characters so much better and we find that they are quite the loveable bunch. There's no shortage of hilariously strange hijinks and unusual absurdities which makes the series stand out in the genre. It's a lighthearted and fun romp and I can't wait to read more!